Key to quality and service improvement initiatives undertaken through the Critical Care Network is the provision of high standard training and education for all staff groups who make up the multi-disciplinary team. There are a variety of educational and training programmes available for acute and critical care supported and/or delivered through the Network in association with the Critical Care Skills Institute. 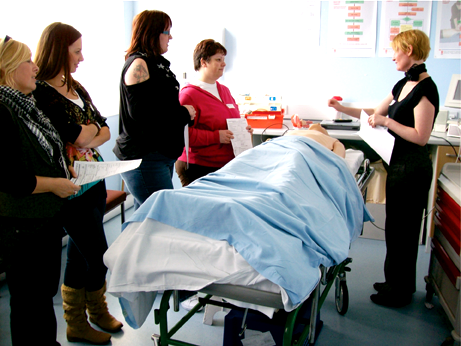 The AIM course was developed in 2003 by critical care staff in Greater Manchester. The purpose, to address the rise in evidence associated with poor patient management outside of the critical care environment connected to deteriorating illness. There are now 3 AIM courses that address the needs of staff working with different patient groups, all of which are built around ABCDE assessment and management. The objective of the course is to provide registered healthcare professionals with the essential knowledge and skills necessary to recognise and respond appropriately to patients with acute and deteriorating illness. The training aims to teach staff the skills and knowledge to undertake intra/inter hospital critical care transfers. It is a one day course built around lectures, workshops and simulation. This course is available to all critical care professionals involved in transferring sick patients.